Arizona is known for it's glorious sunsets, and that may be the reason that the Arizona State Flag includes the stylized rays of a setting sun. 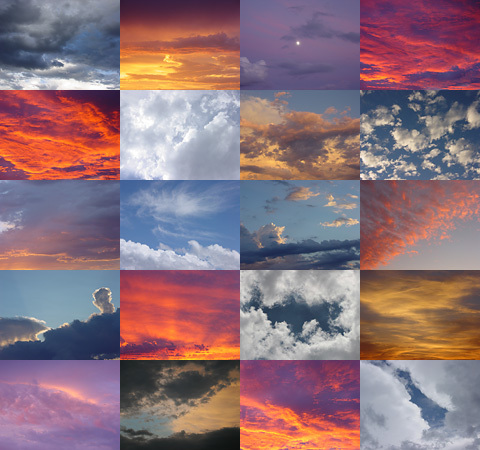 I'm always fascinated and awed by the variety of colors, both vivid and subtle, the sky can assume. The one color that is least represented in the sky is green. I have only seen greenish skies a few times, and they have mostly been the heavy, churning, sickly yellow-greenish clouds of an imminent severe thunderstorm. The one time that I did see truly beautiful green clouds was one deep winter morning in Virginia after an overnight ice storm. I awakened at dawn to see a half ruby red and half emerald green sun rising through the misty, red and green-tinged ice clouds. I quickly grabbed my Pentax camera to get that picture of a lifetime, only to discover that my dad had been playing with the camera settings and they were all wrong. By the time I had fixed everything, the sun and ice clouds were back to their normal colors and the ice-coated trees were glittering in the yellow sunlight. Oh well, I couldn't really be upset with my dad because he had just bought me the Pentax, my very first camera.